Our guests not only love the welcoming atmosphere and majestic views of the mountains…they love our tasty fare. Whether it’s Kevin’s famous Eggs Benedict or our Chef’s complex Pork and Beans, most everyone asks for our recipes, so here they are. At Max’s, we make our own butters to compliment the freshly baked breads for each evening. 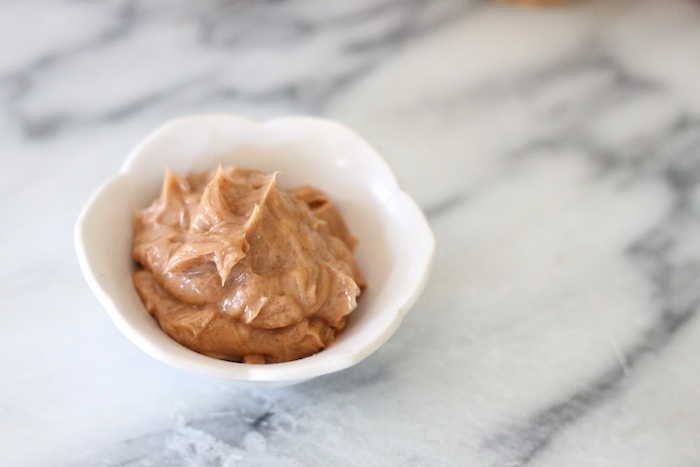 The butters are usually created with local, seasonal ingredients and are always a hit! Use a paddle on a mixer and blend to a uniform consistency, add 1 tsp of salt until it’s too your liking. This is a great recipe for the famous comfort food and we featured at our Boston Globe Travel Show Cooking Demonstration. We saw many old friends and made some new ones that day! Drain beans, use this liquid to water your plants! Put in beans a 2 quart sauce pot and cover with water by a half inch and add the baking soda. Bring to a gentle boil for 15 minutes. Whisk together salt, mustard, pepper, sugar, molasses and very hot water until very smooth. In a Dutch oven or large baking dish with a tight fitting lid that’s as deep as the pork shoulder, add the whole peeled and cored onion, the butter, the pork, the boiled beans (not drained), more water to ensure the beans are covered by liquid and half the sweet mixture. Place in oven and leave alone for 4 hours. 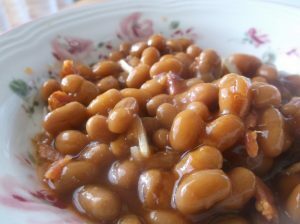 After the fourth hour open the lid and stir the beans and see if the pork is falling off the bone. If pork is not tender yet check each additional half hour until it is. Once you have reached the melting tender stage drip the other half of the sweet mixture over the surface of the whole dish and put back in oven, uncovered, with the heat turned up to 375° and allow to bake an additional ten minutes until the top layer is glazed and sweet. Remove from oven and allow to cool for twenty minutes. 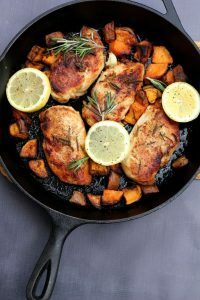 Serve with your favorite braised greens or tender Brussels sprouts. Tis’ The Season! 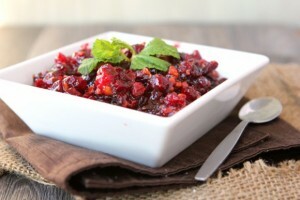 Homemade cranberry sauce is easy to make, offers a beautiful presentation for your holiday table, and will leave your guests begging for the recipe! Stir together sugar, port, and 3/4 cup water in a heavy 3-qt. saucepan until blended. Add cranberries; bring to a boil, and cook over medium-high heat, stirring often, 8 to 10 minutes or until cranberry skins begin to split. Remove from heat, and let cool 15 minutes. Pulse cranberry mixture in a food processor 3 to 4 times or until cranberries are almost pureed; stir in orange liqueur. Cover and chill 8 hours before serving. Store in refrigerator in an airtight container up to 3 weeks. 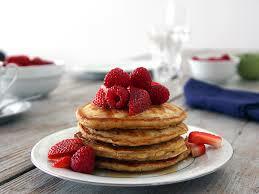 Everyone loves Julia’s Silver Dollar Pancakes. Jen thought it would be a good idea to fill everyone in on the special ingredients that make them so amazing! Pour on hot griddle and flip only once when bubbles form. Place 1 ½ cups grated cheddar cheese on the bottom of the pie crust. Place the sautéed onions and red peppers, then the broccoli evenly in the pie shell. Make sure they are dry! Pour the custard filling into the pie shell and with a fork, gently work the custard into the filling. 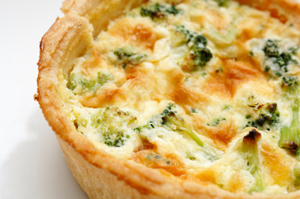 Place the quiche on a sheet pan and bake at 350° for 45-60 minutes or until an inserted knife comes out clean. Let it cool for about 15 minutes before cutting. Saute onions in 2 Tbsp butter, salt lightly. 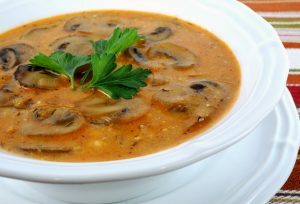 A few minutes later, add mushrooms, 1 tsp dill, 1/2 cup stock or water, soy sauce, and paprika. Cover and simmer 15 minutes. Melt 2 Tbsp remaining butter in large saucepan. Whisk in flour and cook, whisking, a few minutes. Add milk and cook, stirring frequently, over low heat about 10 minutes – until thick. Stir in mushroom mixture and remaining stock. Cover and simmer 10-15 minutes. Just before serving, add salt, pepper, lemon juice, sour cream, and, if desired, extra dill (1 tsp).